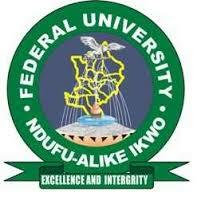 Federal University Ndufu-Alike Ikwo (FUNAI) List of Graduating Students for 2017/2018 Academic Session Uploaded in PDF - Download FUNAI Graduation List in PDF 2017/2018. All Graduands are to download the list and check if their names appear on the list of candidates to be convocated. Any issues should be directed to the institution physically.